Use tab above to register and pay for Classes NOW! Our Toddler Ballet/Tap class is a wonderful introduction to dance that is both structured and fun. We explore jumping, turning, creative movement and the experience of a solo performance. 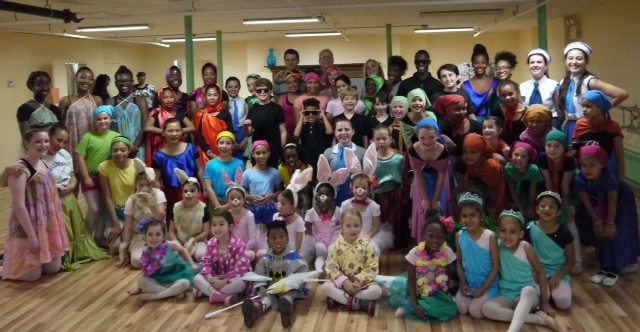 All of our dance and theater classes help students explore their talents with confidence, perseverance and discipline while learning to perform with excitement. We offer Dance Classes for Toddlers, Children & Teens including Ballet, Tap, Jazz/Hip-Hop, Boys Tap/Hip-Hop and Adult classes in Zumba, Tap, Pilates, Yoga, Basic Adult Ballet, Bellydancing, Ballroom, Line Dancing and more. We also have Theater & Music Classes. Adults may take a class in one room and children in another with no interruptions. We have the lowest prices in the area and our studios are bright, clean and new, showcasing local artwork throughout! Click on above tabs for schedules and additional information. We have two performances for our Dance Program, a Winter (Dec 16-17) and Spring Concert (June 9-10), where there are never any costume fees, (we make them ourselves) and tickets to these concerts are $5.00 each. Theater Program has three performances per year, one after each 10 week session, and they are free! We are always on the lookout for new teachers. If you are interested, please contact us at 215-248-1810 or send us a resume at kimwilldance@aol.com.